Harrison Ford (born July 13, 1942) is an American actor. He gained worldwide fame for his starring roles as Han Solo in the Star Wars film series and as the title character of Indiana Jones movie series. Five of his movies are within the 30 top-grossing movies of all time at the US box office (when adjusted for inflation). Ford is also known for playing Rick Deckard in the neo-noir dystopian science fiction film Blade Runner (1982) and its sequel Blade Runner 2049 (2017); John Book in the thriller Witness (1985), for which he was nominated for the Academy Award for Best Actor; and Jack Ryan in the action films Patriot Games (1992) and Clear and Present Danger (1994). His career spans six decades and includes roles in several Hollywood blockbusters, including the epic war film Apocalypse Now (1979), the legal drama Presumed Innocent (1990), the action film The Fugitive (1993), the political action thriller Air Force One (1997), and the psychological thriller What Lies Beneath (2000). Seven of his films have been inducted into the National Film Registry: American Graffiti (1973), The Conversation (1974), Star Wars (1977), Apocalypse Now (1979), The Empire Strikes Back (1980), Raiders of the Lost Ark (1981) and Blade Runner (1982). As of 2016, the U.S. domestic box-office grosses of Ford's films total over US$4.7 billion, with worldwide grosses surpassing $6 billion, making Ford the second highest-grossing U.S. domestic box-office star. Ford is married to actress Calista Flockhart. Ford was born at the Swedish Covenant Hospital in Chicago, Illinois to Christopher Ford (born John William Ford), an advertising executive and former actor, and Dorothy (née Nidelman), a former radio actress. A younger brother, Terence, was born in 1945. His father was Catholic and his mother was Jewish. Ford's paternal grandparents, John Fitzgerald Ford and Florence Veronica Niehaus, were of Irish and German descent, respectively. Ford's maternal grandparents, Harry Nidelman and Anna Lifschutz, were Jewish emigrants from Minsk, Belarus (at that time a part of the Russian Empire). When asked in which religion he and his brother were raised, Ford jokingly responded, "Democrat," "to be liberals of every stripe". In a television interview shown in August 2000, when asked about what influence his Irish Catholic and Russian Jewish ancestry may have had on his life as a person and as an artist, Ford humorously stated, "As a man I've always felt Irish, as an actor I've always felt Jewish." Ford was active in the Boy Scouts of America, and achieved its second-highest rank, Life Scout. He worked at Napowan Adventure Base Scout camp as a counselor for the Reptile Study merit badge. Because of this, he and director Steven Spielberg later decided to depict the young Indiana Jones as a Life Scout in the film Indiana Jones and the Last Crusade. In 1960, Ford graduated from Maine East High School in Park Ridge, Illinois. His was the first student voice broadcast on his high school's new radio station, WMTH, and he was its first sportscaster during his senior year (1959–60). He attended Ripon College in Wisconsin, where he was a philosophy major and a member of the Sigma Nu fraternity. He took a drama class in the final quarter of his senior year to get over his shyness. Ford, a self-described "late bloomer," became fascinated with acting. In 1964, after a season of summer stock with the Belfry Players in Wisconsin, Ford traveled to Los Angeles to apply for a job in radio voice-overs. He did not get it, but stayed in California and eventually signed a $150-a-week contract with Columbia Pictures' new talent program, playing bit roles in films. His first known role was an uncredited one as a bellhop in Dead Heat on a Merry-Go-Round (1966). There is little record of his non-speaking roles (or "extra" work) in film. Ford was at the bottom of the hiring list, having offended producer Jerry Tokovsky after he played a bellboy in the feature. He was told by Tokovsky that when actor Tony Curtis delivered a bag of groceries, he did it like a movie star; Ford felt his job was to act like a bellboy. Ford managed to secure other roles in movies, such as A Time for Killing (The Long Ride Home), starring Glenn Ford, George Hamilton, and Inger Stevens. His speaking roles continued next with Luv (1967), though he was still uncredited. He was finally credited as "Harrison J. Ford" in the 1967 Western film A Time for Killing, but the "J" did not stand for anything, since he has no middle name. It was added to avoid confusion with a silent film actor named Harrison Ford, who appeared in more than 80 films between 1915 and 1932 and died in 1957. Ford later said that he was unaware of the existence of the earlier actor until he came upon a star with his own name on the Hollywood Walk of Fame. Ford soon dropped the "J" and worked for Universal Studios, playing minor roles in many television series throughout the late 1960s and early 1970s, including Gunsmoke, Ironside, The Virginian, The F.B.I., Love, American Style, and Kung Fu. He appeared in the western Journey to Shiloh (1968) and had an uncredited, non-speaking role in Michelangelo Antonioni's 1970 film Zabriskie Point as an arrested student protester. French filmmaker Jacques Demy chose Ford for the lead role of his first American film, Model Shop (released in 1969) but the head of Columbia Pictures thought Ford had "no future" in the film business and told Demy to hire a more experienced actor. The part eventually went to Gary Lockwood. Ford later commented that the experience had been nevertheless a positive one because Demy was the first to show such faith in him. Not happy with the roles being offered to him, Ford became a self-taught professional carpenter to support his then-wife and two young sons. Casting director and fledgling producer Fred Roos championed the young Ford and secured him an audition with George Lucas for the role of Bob Falfa, which Ford went on to play in American Graffiti (1973). Ford's relationship with Lucas would profoundly affect his career later on. After director Francis Ford Coppola's film The Godfather was a success, he hired Ford to expand his office and gave him small roles in his next two films, The Conversation (1974) and Apocalypse Now (1979); in the latter film he played an army officer named "G. Lucas". Harrison Ford's previous work in American Graffiti eventually landed him his first starring film role, when he was hired by Lucas to read lines for actors auditioning for roles in his then-upcoming film Star Wars (1977). Lucas was eventually won over by Ford's performance during these line reads and cast him as Han Solo. Star Wars became one of the most successful movies of all time and established Ford as a superstar. He went on to star in the similarly successful Star Wars sequels, The Empire Strikes Back (1980) and Return of the Jedi (1983), as well as the Star Wars Holiday Special (1978). Ford wanted Lucas to kill off Han Solo at the end of Return of the Jedi, saying, "That would have given the whole film a bottom," but Lucas refused. Ford reprised the role of Han Solo in the sequel Star Wars: The Force Awakens (2015). During filming on June 11, 2014, Ford suffered what was said to be a fractured ankle, when a hydraulic door fell on him. He was rushed to hospital for treatment. Ford's son Ben released details on his father's injury, saying that his ankle would likely need a plate and screws, and that filming could be altered slightly with the crew needing to shoot Ford from the waist up for a short time until he recovered. Ford made his return to filming in mid-August, after a two-month layoff as he recovered from his injury. Ford's character was killed off in The Force Awakens; however, it was subsequently announced, via a casting call, that Ford would return in some capacity as Han Solo in Episode VIII. In February 2016, when the cast for Episode VIII was confirmed, it was indicated that Ford would not reprise his role in the film. When Ford was asked if his character could come back in "some form", he replied, "Anything is possible in space." A Han Solo spin-off movie, Solo: A Star Wars Story, was released in May 2018, but Ford was not involved in the production. Ford's status as a leading actor was solidified when he starred as globe-trotting archeologist Indiana Jones in the film Raiders of the Lost Ark (1981), a collaboration between George Lucas and Steven Spielberg. Though Spielberg was interested in casting Ford from the beginning, Lucas was not, due to having already worked with the actor in American Graffiti and Star Wars, but he eventually relented after Tom Selleck was unable to accept. Ford went on to star in the prequel Indiana Jones and the Temple of Doom (1984) and the sequel Indiana Jones and the Last Crusade (1989). He returned to the role yet again for a 1993 episode of the television series The Young Indiana Jones Chronicles, and even later for the fourth film Indiana Jones and the Kingdom of the Crystal Skull (2008). On March 15, 2016, Walt Disney Studios announced that Ford was scheduled to portray Indiana Jones in a fifth film due for release in July 2019. However, on April 25, 2017 Walt Disney Studios announced that the film would be released on July 10, 2020. Ford has been in other films, including Heroes (1977), Force 10 from Navarone (1978), and Hanover Street (1979). Ford also co-starred alongside Gene Wilder in the buddy-Western The Frisco Kid (1979), playing a bank robber with a heart of gold. He then starred as Rick Deckard in Ridley Scott's cult sci-fi classic Blade Runner (1982), and in a number of dramatic-action films: Peter Weir's Witness (1985) and The Mosquito Coast (1986), and Roman Polanski's Frantic (1988). The 1990s brought Ford the role of Jack Ryan in Tom Clancy's Patriot Games (1992) and Clear and Present Danger (1994); as well as leading roles in Alan Pakula's Presumed Innocent (1990) and The Devil's Own (1997); Andrew Davis' The Fugitive (1993); Sydney Pollack's remake of Sabrina (1995); and Wolfgang Petersen's Air Force One (1997). Ford also played straight dramatic roles, including an adulterous husband in both Presumed Innocent (1990) and What Lies Beneath (2000), and a recovering amnesiac in Mike Nichols' Regarding Henry (1991). Many of Ford's major film roles came to him by default through unusual circumstances: he won the role of Han Solo while reading lines for other actors, was cast as Indiana Jones because Tom Selleck was not available, he also took over the role of Jack Ryan supposedly due to Alec Baldwin's fee demands, Baldwin had previously played the role of Ryan in The Hunt for Red October. Starting in the late 1990s, Ford appeared in several critically derided and/or commercially disappointing movies, including Six Days, Seven Nights (1998); Random Hearts (1999); K-19: The Widowmaker (2002); Hollywood Homicide (2003); Firewall (2006); and Extraordinary Measures (2010). One exception was 2000's What Lies Beneath, which grossed over $155 million in the United States and $291 million worldwide. In the 2001 Guinness Book of World Records, Ford was listed as the richest male actor in the world. In 2004, Ford declined a chance to star in the thriller Syriana, later commenting that "I didn't feel strongly enough about the truth of the material and I think I made a mistake." The role eventually went to George Clooney, who won an Oscar and a Golden Globe for his work. Prior to that, he had passed on a role in another Stephen Gaghan-written role, Robert Wakefield in Traffic. That role went to Michael Douglas. In 2008, Ford enjoyed success with the release of Indiana Jones and the Kingdom of the Crystal Skull, another Lucas/Spielberg collaboration. The film received generally positive reviews and was the second highest-grossing film worldwide in 2008. He later said he would like to star in another sequel, "...if it didn't take another 20 years to digest." Other 2008 work included Crossing Over, directed by Wayne Kramer. In the film, he plays an ICE / Homeland Security Investigations Special Agent, working alongside Ashley Judd and Ray Liotta. He also narrated a feature documentary film about the Dalai Lama entitled Dalai Lama Renaissance. Ford filmed the medical drama Extraordinary Measures in 2009 in Portland, Oregon. Released January 22, 2010, the film also starred Brendan Fraser and Alan Ruck. Also in 2010, he co-starred in the film Morning Glory, along with Patrick Wilson, Rachel McAdams, and Diane Keaton. In July 2011, Ford starred alongside Daniel Craig and Olivia Wilde in the science fiction Western film Cowboys & Aliens. To promote the film, Ford appeared at the San Diego Comic-Con International and, apparently surprised by the warm welcome, told the audience, "I just wanted to make a living as an actor. I didn't know about this." Also in 2011, Ford starred in Japanese commercials advertising the video game Uncharted 3: Drake's Deception for the PlayStation 3. 2013 began a trend that saw Ford accepting more diverse supporting roles. That year, Ford co-starred in the corporate espionage thriller Paranoia, with Liam Hemsworth and Gary Oldman, and directed by Robert Luketic, as well as Ender's Game, 42, and Anchorman 2: The Legend Continues. His performance as Branch Rickey in 42 was praised by many critics and garnered Ford a nomination as best supporting actor for the Satellite Awards. In 2014, he appeared in The Expendables 3 and the documentary Flying the Feathered Edge: The Bob Hoover Project. The next year, Harrison Ford co-starred in The Age of Adaline with Blake Lively to good notices. On February 26, 2015, Alcon Entertainment announced Ford would reprise his role as Rick Deckard in Blade Runner 2049. The film was well received by critics, Scott Collura of IGN called it a "deep, rich, smart film that's visually awesome and full of great sci-fi concepts" and Ford's role "a quiet, sort of gut-wrenching interpretation to Deckard and what he must've gone through in the past three decades." The Economist has described Ford's appearance in the film as "little more than a cameo", despite his being used heavily in the film's promotion. The film grossed $259.3 million worldwide, far short of the estimated $400 million that the film needed to gross in order to break even. In 2018, Ford accepted his first role as a voice actor in an animated film, The Secret Life of Pets 2. That same year, with filming for a fifth Indiana Jones film having been delayed by a year, he also agreed to headline a big-budget adaptation of Jack London's The Call of the Wild, playing prospector John Thornton. Ford is one of Hollywood's most private actors, guarding much of his personal life. Ford has been married three times and has five children. His first wife was Mary Marquardt or Mary Ford Becker, from 1964 until their divorce in 1979. They had two sons, chef-restaurateur Benjamin Ford (born 1966) and clothier Willard Ford (born 1969). Ford's second wife was screenwriter Melissa Mathison; they married in March 1983 and separated in late 2000, subsequently divorcing. They had two children, actor/musician Malcolm Ford (born 1987) and actress Georgia Ford (born 1990). Ford began dating actress Calista Flockhart after meeting at the 2002 Golden Globes, and together they are parents to her adopted son, Liam (born 2001). Ford proposed to Flockhart over Valentine's Day weekend in 2009. They married on June 15, 2010, in Santa Fe, New Mexico, where Ford was filming Cowboys & Aliens. In her 2016 autobiography The Princess Diarist, Carrie Fisher claimed that she and Ford had a three-month affair in 1976 during the filming of Star Wars. Benjamin Ford co-owns Ford's Filling Station, a gastropub with two locations: at The Marriott, L.A. Live, Downtown Los Angeles, and at LAX Terminal 5. His son Willard is the owner of Strong Sports Gym, and was co-owner of Ford & Ching and owner of the Ludwig Clothing company. During the June 1983 filming of Indiana Jones and the Temple of Doom in London, Ford herniated a disc in his back. The then-40 year old actor was forced to fly back to Los Angeles for an operation. He returned six weeks later. On June 11, 2014, Ford injured his ankle during filming of Star Wars: The Force Awakens. He was airlifted to John Radcliffe Hospital in Oxford, England. Ford is a licensed pilot of both fixed-wing aircraft and helicopters, and owns an 800-acre (320-hectare) ranch in Jackson, Wyoming, approximately half of which he has donated as a nature reserve. On several occasions, Ford has personally provided emergency helicopter services at the request of local authorities, in one instance rescuing a hiker overcome by dehydration. Ford began flight training in the 1960s at Wild Rose Idlewild Airport in Wild Rose, Wisconsin, flying in a Piper PA-22 Tri-Pacer, but at $15 an hour (equivalent to $124 in 2018), he could not afford to continue the training. In the mid-1990s, he bought a used Gulfstream II and asked one of his pilots, Terry Bender, to give him flying lessons. They started flying a Cessna 182 out of Jackson, Wyoming, later switching to Teterboro, New Jersey, flying a Cessna 206, the aircraft he soloed in. Ford keeps his aircraft at Santa Monica Airport, though the Bell 407 is often kept and flown in Jackson, Wyoming, and has been used by the actor in two mountain rescues during his assigned duty time with Teton County Search and Rescue. On one of the rescues, Ford recovered a hiker who had become lost and disoriented. She boarded Ford's helicopter and promptly vomited into one of the rescuers' caps, unaware of who the pilot was until much later; "I can't believe I barfed in Harrison Ford's helicopter!" she said later. Ford flies his de Havilland Canada DHC-2 Beaver (N28S) more than any of his other aircraft, and has repeatedly said that he likes this aircraft and the sound of its Pratt & Whitney R-985 radial engine. According to Ford, it had been flown in the CIA's Air America operations, and was riddled with bullet holes that had to be patched up. In March 2004, Ford officially became chairman of the Young Eagles program of the Experimental Aircraft Association (EAA). Ford was asked to take the position by Greg Anderson, Senior Vice President of the EAA at the time, to replace General Chuck Yeager, who was vacating the post that he had held for many years. Ford at first was hesitant, but later accepted the offer and has made appearances with the Young Eagles at the EAA AirVenture Oshkosh gathering at Oshkosh, Wisconsin, for two years. In July 2005, at the gathering in Oshkosh, Ford agreed to accept the position for another two years. He has flown over 280 children as part of the Young Eagles program, usually in his DHC-2 Beaver, which can seat the actor and five children. Ford stepped down as program chairman in 2009 and was replaced by Captain Chesley Sullenberger and First Officer Jeff Skiles. He is involved with the EAA chapter in Driggs, Idaho, just over the Teton Range from Jackson, Wyoming. On July 28, 2016, Ford flew the two millionth Young Eagle at the EAA AirVenture convention. As of 2009, Ford appears in Internet advertisements for General Aviation Serves America, a campaign by the advocacy group Aircraft Owners and Pilots Association (AOPA). He has also appeared in several independent aviation documentaries, including Wings Over the Rockies (2009), Flying The Feathered Edge: The Bob Hoover Project (2014), and Living in the Age of Airplanes (2015). Ford is an honorary board member of the humanitarian aviation organization Wings of Hope, and is known for having made several trips to Washington, D.C. to fight for pilots' rights. He has also donated substantial funds to aerobatic champion Sean Tucker's charitable program The Bob Hoover Academy, which educates at-risk teens in central California and teaches them how to fly, named in honor of legendary pilot Bob Hoover. On October 23, 1999, Harrison Ford was involved in the crash of a Bell 206L4 LongRanger helicopter (N36R). The NTSB accident report states that Ford was piloting the aircraft over the Lake Piru riverbed near Santa Clarita, California, on a routine training flight. While making his second attempt at an autorotation with powered recovery, Ford allowed the aircraft's altitude to drop to 150–200 feet before beginning power-up. The aircraft was unable to recover power before hitting the ground. The aircraft landed hard and began skidding forward in the loose gravel before one of its skids struck a partially embedded log, flipping the aircraft onto its side. Neither Ford nor the instructor pilot suffered any injuries, though the helicopter was seriously damaged. When asked about the incident by fellow pilot James Lipton in an interview on the TV show Inside the Actor's Studio, Ford replied, "I broke it." On March 5, 2015, Ford's plane, believed to be a Ryan PT-22 Recruit, made an emergency landing on the Penmar Golf Course in Venice, California. Ford had radioed in to report that the plane had experienced engine failure. He was taken to Ronald Reagan UCLA Medical Center, where he was reported to be in fair to moderate condition. Ford suffered a broken pelvis and broken ankle during the accident, as well as other injuries. On February 13, 2017, Ford landed an Aviat Husky at John Wayne Airport (in Orange County, California) on the taxiway left of runway 20L. A Boeing 737 was holding short of the runway on the taxiway when Ford overflew them. Ford is vice-chair of Conservation International an American nonprofit environmental organization headquartered in Arlington, Virginia. The organization's intent is to protect nature. In September 2013, Ford, while filming an environmental documentary in Indonesia, interviewed the Indonesian Forestry Minister, Zulkifli Hasan. After the interview the Presidential Advisor, Andi Arief, accused Ford and his crew of "harassing state institutions" and publicly threatened them with deportation. Questions within the interview concerned the Tesso Nilo National Park, Sumatra. It was alleged the Minister of Forestry was given no prior warning of questions nor the chance to explain the challenges of catching people with illegal logging. Ford was provided an audience with the Indonesian President, Susilo Bambang Yudhoyono, during which he expressed concerns regarding Indonesia's environmental degradation and the government efforts to address climate change. In response, the President explained Indonesia's commitment to preserving its oceans and forests. In 1993, the arachnologist Norman Platnick named a new species of spider Calponia harrisonfordi, and in 2002, the entomologist Edward O. Wilson named a new ant species Pheidole harrisonfordi (in recognition of Harrison's work as Vice Chairman of Conservation International). Since 1992, Ford has lent his voice to a series of public service messages promoting environmental involvement for EarthShare, an American federation of environmental and conservation charities. Ford has been a spokesperson for Restore Hetch Hetchy, a non-profit organization dedicated to restoring Yosemite National Park's Hetch Hetchy Valley to its original condition. Ford appears in the documentary series Years of Living Dangerously, which provides reports on those affected by, and seeking solutions to, climate change. Like his parents, Ford is a lifelong Democrat. On September 7, 1995, Ford testified before the U.S. Senate Foreign Relations Committee in support of the Dalai Lama and an independent Tibet. In 2007, he narrated the documentary Dalai Lama Renaissance. In 2003, he publicly condemned the Iraq War and called for "regime change" in the United States. He also criticized Hollywood for making movies which were "more akin to video games than stories about human life and relationships", and he called for more gun control in the United States. After Republican presidential candidate Donald Trump said his favorite role of Ford's was Air Force One because he "stood up for America", Ford reasoned that it was just a film and made critical statements against Trump's presidential bid. Following on his success portraying the archaeologist Indiana Jones, Ford also plays a part in supporting the work of professional archaeologists. He serves as a General Trustee on the Governing Board of the Archaeological Institute of America (AIA), North America's oldest and largest organization devoted to the world of archaeology. Ford assists them in their mission of increasing public awareness of archaeology and preventing looting and the illegal antiquities trade. Ford participated in a Star Wars promotion geared toward fans who donated to Star Wars: Force for Change on video call which offered them the opportunity to purchase tickets to the premiere of The Force Awakens. In 1994, the National Association of Theatre Owners named Ford "Star of the Year". In the October 1997 issue of Empire Magazine, Ford was ranked no. 1 in "The Top 100 Movie Stars of All Time". In 1998, People Magazine named Ford the "Sexiest Man Alive". For 3 consecutive years (1998, 1999, and 2000), the Harris Poll named Ford "America's Favorite Movie Star". Ford received the AFI Life Achievement Award in 2000. He received an Academy Award for Best Actor nomination for his performance in Witness, for which he also received "Best Actor" BAFTA and Golden Globe nominations. He was given the Cecil B. DeMille Award at the 2002 Golden Globe Awards and on June 2, 2003, was presented with a star on the Hollywood Walk of Fame. Three additional Best Actor Golden Globe nominations have gone to Ford, for The Mosquito Coast, The Fugitive and Sabrina. In 2006 he was awarded the Jules Verne Award, given to an actor who has "encouraged the spirit of adventure and imagination" throughout their career. He was presented with the first-ever Hero Award at the 2007 Scream Awards for his many iconic roles, including Indiana Jones and Han Solo (both roles earned him two Saturn Awards for Best Actor in 1981 and 2015, respectively), and in 2008 he received the Spike TV's Guy's Choice Award for "Brass Balls". Ford has also been honored multiple times for his involvement in general aviation, receiving the Living Legends of Aviation Award and the Experimental Aircraft Association's Freedom of Flight Award in 2009, the Wright Brothers Memorial Trophy in 2010, and the Al Ueltschi Humanitarian Award in 2013. In 2013, Flying Magazine ranked him number 48 on their list of the 51 Heroes of Aviation. ^ "Top 100 Films of All-Time - Adjusted For Inflation". www.filmsite.org. Retrieved June 27, 2018. ^ Robinson, Will (January 8, 2016). "Harrison Ford is now the highest-grossing actor in U.S. box office history". Entertainment Weekly. Retrieved January 10, 2016. ^ "Box Office Mojo – People Index". www.boxofficemojo.com. Retrieved November 16, 2016. ^ Duke, Brad (2004). "1. An Ordinary Upbringing". Harrison Ford: the films. McFarland. p. 5. ISBN 9780786420162. Retrieved February 20, 2010. ^ a b c Jenkins, Gary (March 1999). Harrison Ford: Imperfect Hero. Kensington Books. pp. 9–12. ISBN 0-8065-8016-X. ^ "Harrison Ford Biography (1942–)". FilmReference.com. Retrieved May 23, 2008. ^ Vallely, Paul (May 9, 2008). "Harrison Ford: Whip hand". The Independent. Retrieved April 27, 2018. ^ Gallagher, William (October 12, 2000). "Harrison Ford". BBC. Retrieved April 27, 2018. ^ "Mother's Day, Hollywood-style: 20 movie icons with their mums". The Daily Telegraph. March 26, 2017. Retrieved April 27, 2018. ^ Bloom, Nate (December 12, 2003). "Celebrity Jews". Jewish News Weekly. Retrieved May 23, 2008. ^ Heath, Chris (September 13, 2017). "Harrison Ford on Star Wars, Blade Runner, and Punching Ryan Gosling in the Face". GQ magazine. Retrieved April 27, 2018. ^ a b c d e f g h i j k l m Inside the Actors Studio. Harrison Ford, Season 6, Episode 613. August 20, 2000. ^ "Ten American showbiz celebrities of Russian descent". Pravda. November 18, 2005. Retrieved May 23, 2008. ^ Lin, Joseph (May 10, 2010). "Top 10 College Dropouts". TIME. Retrieved August 30, 2016. ^ Duke, Brad (2005). Harrison Ford: The Films. Retrieved November 1, 2011. ^ Thomas, Bob (March 4, 2000). "Harrison Ford shy, thoughtful". Bangor Daily News. Bangor, Maine. p. H3. Retrieved May 17, 2015. ^ White, Dana. "Harrison Ford: Imperfect Hero (9780735100893): Garry Jenkins: Books". Amazon.com. Retrieved February 18, 2012. ^ "Harrison Ford Wanted Han Solo to Die". Starpulse. March 2, 2006. Archived from the original on May 6, 2008. Retrieved May 23, 2008. ^ "Star Wars: Episode VII Cast Announced". StarWars.com. April 29, 2014. Retrieved June 12, 2014. ^ Collura, Scott (June 12, 2014). "HARRISON FORD INJURED ON THE SET OF STAR WARS: EPISODE 7". IGN. Retrieved June 12, 2014. ^ Ford, Rebecca (June 14, 2014). "Harrison Ford's 'Star Wars' Injury: New Details!". Access Hollywood. Archived from the original on July 15, 2014. Retrieved June 14, 2014. ^ "'Star Wars: Episode VII' to resume filming". CNN. August 13, 2014. Retrieved August 13, 2014. ^ "Harrison Ford to return to 'Star Wars'". Chron. August 1, 2014. Retrieved August 14, 2014. ^ Breznican, Anthony (December 21, 2015). "We Need To Talk About Kylo". Entertainment Weekly. Retrieved December 23, 2015. ^ Shepherd, Jack (December 25, 2015). "Star Wars 8 casting call reveals Han Solo will be back for Force Awakens sequel". The Independent. Retrieved December 25, 2015. ^ "Star Wars: Episode VIII Now Filming". starwars.com. StarWars.com. February 15, 2016. Retrieved March 22, 2016. ^ "Ford took Indiana role to work with Spielberg again". BBC News. March 22, 2016. Retrieved March 22, 2016. ^ (DVD) Indiana Jones: Making the Trilogy. Paramount Pictures. 2003. ^ "Indiana Jones: Harrison Ford to appear in fifth film". BBC News. March 15, 2016. Retrieved March 16, 2016. ^ Jack Shepherd (April 26, 2017). "Indiana Jones 5 release date pushed back by Disney". independent.co.uk. The Independent. Retrieved April 26, 2017. ^ "What Lies Beneath (2000)". Box Office Mojo. Retrieved February 18, 2012. ^ a b c d e "Harrison Ford Trivia". Internet Movie Database. Retrieved April 23, 2018. ^ "Harrison Ford Regrets Passing on 'Syriana'". Starpulse. March 3, 2006. Archived from the original on May 31, 2008. Retrieved May 23, 2008. ^ "2008 Worldwide Grosses". Rotten Tomatoes. Retrieved August 7, 2009. ^ Kilday, Gregg (January 2, 2007). "Can you dig it? Fourth 'Indy' in '08". The Hollywood Reporter. Archived from the original on July 18, 2008. Retrieved May 23, 2008. ^ "Dalai Lama Renaissance Documentary Film". Dalailamafilm.com. February 12, 2010. Retrieved March 7, 2010. ^ Turnquist, Kristi (January 21, 2010). "'Extraordinary Measures,' filmed in Portland and starring Brendan Fraser and Harrison Ford, opens Friday". OregonLive (The Oregonian). Retrieved June 22, 2017. ^ Fleming, Michael (June 4, 2009). "Keaton, Goldblum join 'Glory'". Variety. Retrieved September 11, 2009. ^ Graser, Marc (July 24, 2010). "Harrison Ford pleases Comic-Con crowds". Variety. Retrieved November 18, 2010. ^ Trumbore, Dave. "Corporate Espionage Thriller 'Paranoia' to Star Harrison Ford, Gary Oldman and Liam Hemsworth". Collider. Retrieved April 13, 2012. ^ Donnelly, Matt; Sneider, Jeff (February 26, 2015). "Denis Villeneuve to Direct 'Blade Runner' Sequel Starring Harrison Ford". TheWrap.com. Archived from the original on March 29, 2015. Retrieved June 20, 2015. ^ "Blade Runner 2049". Rotten Tomatoes. Retrieved December 28, 2018. ^ Collura, Scott (September 29, 2017). "Blade Runner 2049 Review". IGN. Retrieved June 18, 2018. ^ N.B. (October 6, 2017). ""Blade Runner 2049" is a flawed replicant". The Economist. Archived from the original on October 8, 2017. ^ Pamela McClintock (September 21, 2017). "'Blade Runner 2049' Losses Could Hit $80 Million for Producer Alcon". The Hollywood Reporter. Archived from the original on December 21, 2017. Retrieved December 26, 2017. ^ Jr, Mike Fleming (April 25, 2018). "Harrison Ford Takes First Animated Role, In Illumination's 'The Secret Life Of Pets 2'". Deadline. Retrieved September 27, 2018. ^ Lang, Brent (July 16, 2018). "Harrison Ford Eyes 'Call of the Wild' (EXCLUSIVE)". Variety. Retrieved September 27, 2018. ^ "Harrison Ford Proposes to Calista Flockhart". People. March 21, 2009. ^ "Harrison Ford and Calista Flockhart Get Married!". People. June 16, 2010. ^ France, Lisa Respers (November 17, 2016). "Carrie Fisher writes of Harrison Ford affair". CNN.com. ^ "Ford's Filling Station L.A. Live". January 1, 2014. Archived from the original on August 22, 2015. Retrieved August 27, 2015. ^ "Ford's Filling Station at LAX". Retrieved February 27, 2017. ^ Ford, Willard. "Stong Sports Gym – A Unique Place For Martial Arts". Retrieved September 15, 2015. ^ Asch, Andrew (June 6, 2009). "Ludwig: The Composer's New Clothes". Apparel News. Archived from the original on June 12, 2010. Retrieved August 27, 2011. ^ Rinzer, J. W. (2008). The Complete Making of Indiana Jones: The Definitive Story Behind All Four Films. New York: Del Rey, imprint of Random House, Inc. p. 153. ISBN 978-0-345-50129-5. Lucas arrived on June 20, . "Harrison was in really terrible pain," he says. "He was on the set lying on a gurney. They would lift him up and he'd walk through his scenes, and they'd get him back on the bed." That same day Ford filmed his fight with the Thuggee assassin in Indy's suite on Stage 3. "Harrison had to roll backward on top of the guy," Spielberg says. "At that moment his back herniated and Harrison let out a call for help." ^ "Harrison Ford breaks ankle on Star Wars film set at Pinewood studios". BBC News. Retrieved October 2, 2014. ^ "Harrison Ford credited with helicopter rescue of sick hiker in Idaho". CNN. August 7, 2000. Archived from the original on February 2, 2008. Retrieved May 23, 2008. ^ Freeze, Di. "Harrison Ford: Promoting Aviation through Young Eagles" Archived August 28, 2011, at the Wayback Machine Aviation Journals. September 2005. ^ Donaldson, Lynn. "Harrison Ford Crafts a Masterpiece in Wyoming" The Land Report. October 2007. ^ "Harrison Ford Discusses Piloting His Beaver into the Bush", Huffington Post, May 21, 2008. ^ Per Ford's remarks on Late Night with David Letterman (viewed July 9, 2008). ^ "Harrison Ford Flies 2 Millionth Young Eagle". Retrieved August 25, 2016. ^ Richards, Paul (January 9, 2015). "Wings Over The Rockies". YouTube. Retrieved August 30, 2016. ^ "Living in the Age of Airplanes Official Trailer 2 (2015) - Airplane Documentary HD". Youtube. Retrieved January 12, 2017. ^ "Wings of Hope's Honorary Council Members". Wings of Hope. Retrieved March 14, 2017. ^ a b "51 Heroes of Aviation". Retrieved October 25, 2014. ^ "Every Kid Can Fly". Flying Magazine. Retrieved April 5, 2019. ^ AirSafe.com, LLC. "Helicopter Accident Involving Actor Harrison Ford". Airsafe.com. Retrieved June 12, 2014. ^ "LAX00LA024". National Transportation Safety Board. Archived from the original on May 15, 2003. Retrieved May 23, 2008. ^ Blankstein, Andrew (March 5, 2015). "Harrison Ford Reported Fair After Plane Crash". NBC News. Retrieved March 5, 2015. ^ Dillon, Nancy; Blidner, Rachelle (March 6, 2015). "'My first instinct was to run to the airplane': Surgeon recalls moment he helped Harrison Ford after crash". New York Daily News. Retrieved March 6, 2015. ^ Schwebke, Scott (February 14, 2017). "Harrison Ford lands plane on taxiway instead of runway, flies over passenger jet at John Wayne Airport". The Orange County Register. Retrieved February 14, 2017. ^ "Harrison Ford: There are no great movies on global environmental issues". CNN. Archived from the original on May 2, 2013. ^ "About Us". Conservation International. Retrieved February 3, 2012. ^ "Harrison Ford Shocks Indonesian Minister with Heated Climate Interview". Australian Broadcasting Corporation. September 10, 2013. Retrieved September 11, 2013. ^ Bachelard, Michael (September 11, 2013). "Harrison Ford Upsets Indonesian Minister with 'Rude' Interview". The Sydney Morning Herald. Retrieved September 11, 2013. ^ "FM Bemoans Harrison Ford's Attitude". The Jakarta Post. September 9, 2013. Retrieved September 11, 2013. ^ "Harrison Ford's Environment Documentary Questions 'Shocked' Indonesian Forestry Minister". Huffington Post. September 10, 2013. Retrieved September 11, 2013. ^ "Harrison Ford Interviews Indonesia President Susilo Bambang Yudhoyono On Environment". Huffington Post. September 10, 2013. Archived from the original on September 12, 2013. Retrieved September 11, 2013. ^ "Harrison Ford, Indonesia President Discuss Climate". The San Diego Union-Tribune. September 10, 2013. Retrieved September 11, 2013. ^ "Harrison Ford". Our Planet. Archived from the original on September 5, 2008. Retrieved May 23, 2008. ^ "EarthShare PSA: "Promises"". Earthshare. October 1, 2008. Retrieved December 27, 2017. ^ "Discover Hetch Hetchy with Harrison Ford Preview". Restore Hetch Hetchy. Archived from the original on November 19, 2012. Retrieved May 16, 2013. ^ "Years Of Living Dangerously". yearsoflivingdangerously.com. 2015. Retrieved May 17, 2015. ^ "2008 Presidential Donor Watch". Newsmeat. Archived from the original on February 5, 2010. Retrieved May 23, 2008. ^ Khashyar Darvich (January 1, 2009). "Celebrities and others banned from entering Tibet or China". Dalailamafilm.com. Retrieved November 11, 2010. ^ "Harrison Ford blasts US Iraq policy". The Age. Melbourne, Australia. August 27, 2003. Retrieved May 23, 2008. ^ McAfee, Melonyce (December 11, 2015). "Harrison Ford has a fan in Trump". CNN. ^ Dawn, Randee (December 11, 2015). "Harrison Ford reminds Donald Trump that 'Air Force One' was only a movie". today.com. ^ "About the AIA". Archaeological Institute of America. Retrieved September 7, 2010. ^ "Harrison Ford surprises 'Star Wars' fans in new Force For Change charity video". November 19, 2015. ^ "Star Wars: Harrison Ford Surprises Fans in New Force for Change Video". November 19, 2015. ^ "Disney Pushes 'Indiana Jones 5' a Year to 2021, Dates 'Maleficent 2,' 'Jungle Cruise'". The Hollywood Reporter. July 10, 2018. ^ "AFI Life Achievement Award". Retrieved February 17, 2012. ^ "Guys Choice 2008 – Harrison Ford". Spike TV. Archived from the original on August 4, 2008. Retrieved August 31, 2008. ^ "Guys Choice". PR Inside. Archived from the original on May 14, 2012. ^ "Sixth Annual Living Legends of Aviation Awards". Retrieved October 25, 2014. ^ "Harrison Ford Receives Freedom of Flight Award". Archived from the original on February 16, 2015. Retrieved October 25, 2014. ^ "Harrison Ford receives aviation's highest award". Retrieved October 25, 2014. ^ "Harrison Ford Receives Al Ueltschi Humanitarian Award". Retrieved October 25, 2014. "Harrison Ford Interview". CinemasOnline. 2002. Archived from the original on December 11, 2003. Retrieved March 19, 2006. Dawson, Angela (June 12, 2003). "Harrison Ford: Hollywood loved him even before they knew him". The Cincinnati Post (Entertainment News Wire). E. W. Scripps Company. Archived from the original on February 27, 2005. Retrieved March 19, 2006. Honeycutt, Kirk (1986). "Harrison Ford on Harrison Ford". Daily News. Retrieved March 19, 2006. Leopold, Todd (February 9, 2006). "Harrison Ford and the movie machine". Cable News Network. Retrieved March 19, 2006. Rader, Dotson (July 7, 2002). "I found purpose". Parade. Archived from the original on August 12, 2002. Retrieved March 19, 2006. Turan, Kenneth (1986). "Harrison Ford wants to be alone". GQ. Archived from the original on February 15, 2001. Retrieved March 19, 2006. 42 is a 2013 American biographical sports film written and directed by Brian Helgeland about the racial integration of American professional baseball by player Jackie Robinson, who wore jersey number 42 through his Major League career. The film stars Chadwick Boseman as Robinson, and Harrison Ford as Branch Rickey, with Alan Tudyk, Nicole Beharie, Christopher Meloni, André Holland, Lucas Black, Hamish Linklater, and Ryan Merriman appearing in supporting roles. The film received generally positive reviews and grossed over $97 million on a $40 million budget. 42 was released in North America on April 12, 2013. AFI's 10 Top 10 honors the ten greatest US films in ten classic film genres. Presented by the American Film Institute (AFI), the lists were unveiled on a television special broadcast by CBS on June 17, 2008. In the special, various actors and directors, among them Clint Eastwood, Quentin Tarantino, Kirk Douglas, Harrison Ford, Martin Scorsese, Steven Spielberg, George Lucas, Roman Polanski, and Jane Fonda, discussed their admiration for and personal contributions to the films cited. The entire list of 500 nominated films is available on the American Film Institute website. To date, this is the final program in AFI's countdown specials. Call of the Wild is an upcoming American live-action CGI-animated adventure film based on the Jack London's 1903 novel The Call of the Wild. The film is directed by Chris Sanders, written by Michael Green, and stars Harrison Ford, Dan Stevens, Karen Gillan, Omar Sy, and Bradley Whitford. It will be released on December 25, 2019 by Walt Disney Studios Motion Pictures under the 20th Century Fox banner. Han Solo is a fictional character in the Star Wars franchise, who is a pilot from the planet Corellia. A primary character in the original film trilogy, Han is the captain of the Millennium Falcon, along with his Wookiee co-pilot Chewbacca, whereby both pilots became involved in the Rebel Alliance's struggle against the Galactic Empire. During the course of the Star Wars narrative, Han becomes a chief figure in the Alliance and the love interest of Princess Leia. In the sequel trilogy, Han is Leia's estranged husband and the father of fallen Jedi Kylo Ren. Harrison Ford portrayed Han in the original Star Wars trilogy as well as the first film in the sequel trilogy. Mythologist Joseph Campbell said of the character, "He thinks he’s an egoist; but he really isn’t. ... there’s something else pushing [him]." In 1997, creator of the franchise George Lucas described Han as "a cynical loner who realizes the importance of being part of a group and helping for the common good".Alden Ehrenreich portrayed a young Han in the 2018 spin-off film Solo: A Star Wars Story. Additionally, the character is the subject of many books, comics and other media based on the franchise. "Han shot first" refers to a controversial change made to a scene in the science fiction film Star Wars (1977), in which Han Solo (Harrison Ford) is confronted by the bounty hunter Greedo (Paul Blake) in the Mos Eisley cantina. In the original version of the scene, Han shoots Greedo dead. Later versions are edited so that Greedo attempts to fire at Han first. Director George Lucas altered the scene to give Solo more justification for acting in self-defense. Many fans and commentators oppose the change, feeling it weakens Solo's character. The controversy is referenced in the 2018 film Solo: A Star Wars Story. Harrison Edward Ford (March 16, 1884 – December 2, 1957) was an American stage and film actor. He was a leading Broadway theatre performer and a star of the silent film era. Indiana Jones is an American media franchise based on the adventures of Dr. Henry Walton "Indiana" Jones, Jr., a fictional professor of archaeology. It began in 1981 with the film Raiders of the Lost Ark. A prequel, Indiana Jones and the Temple of Doom, followed in 1984, and a sequel, Indiana Jones and the Last Crusade, was released in 1989. A fourth film, Indiana Jones and the Kingdom of the Crystal Skull, was released in 2008, and was the last in the series to be distributed by Paramount Pictures. A fifth film is scheduled to be released in mid-2021. The series was created by George Lucas, and its films are directed by Steven Spielberg and star Harrison Ford as the title character. The Walt Disney Company has owned the Indiana Jones intellectual property since its acquisition of Lucasfilm, the series' production company, in 2012. Paramount retains the distribution rights to the first four films and television series. 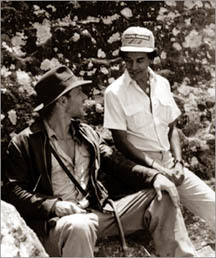 The franchise expanded to television in 1992 with the release of The Young Indiana Jones Chronicles, a series featuring adventures the character had as a child as he traveled around the world with his father. Marvel Comics began publishing The Further Adventures of Indiana Jones in 1983, and Dark Horse Comics earned the comic book rights to the character in 1991. Novelizations of the films have been published, as well as many novels with original adventures, including a series of German novels by Wolfgang Hohlbein, twelve novels set before the films published by Bantam Books, and a series set during the character's childhood inspired by the television show. Numerous Indiana Jones video games have been released since 1982. Morning Glory is a 2010 American comedy film directed by Roger Michell and written by Aline Brosh McKenna. It stars Rachel McAdams, Harrison Ford and Diane Keaton, with Patrick Wilson, John Pankow and Jeff Goldblum. The plot revolves around young and devoted morning television producer Becky Fuller (McAdams), who is hired as an executive producer on the long-running morning show DayBreak, at a once-prominent but currently failing network in New York City. Eager to keep the show on air, she recruits a former news journalist and anchor (Ford) who disapproves of co-hosting a show that does not deal with real news stories. After some delays, the film was released in the United States on November 10, 2010, and abroad in 2011. This marked the first time that Bad Robot Productions produced a comedy film. Morning Glory received mixed reviews and had moderate success at the box office, grossing $60 million worldwide. Patriot Games is a 1992 American spy thriller film directed by Phillip Noyce and based on Tom Clancy's novel of the same name. It is a sequel to the 1990 film The Hunt for Red October, but with different actors in the leading roles, Harrison Ford starring as Jack Ryan and Anne Archer as his wife. James Earl Jones is the lone holdover, reprising his role as Admiral James Greer. The cast also includes Sean Bean, Patrick Bergin, Thora Birch, Samuel L. Jackson, James Fox, and Richard Harris. The film premiered in theaters in the United States on June 5, 1992 and spent two weeks as the No. 1 film, grossing $178,051,587 in worldwide box office business. The next installment in the film series, Clear and Present Danger, also starred Ford and Archer. Sabrina is a 1995 American romantic comedy-drama film adapted by Barbara Benedek and David Rayfiel. It is a remake of the 1954 film Sabrina co-written and directed by Billy Wilder that starred Humphrey Bogart, Audrey Hepburn, and William Holden, which in turn was based upon a play titled Sabrina Fair. It was directed by Sydney Pollack, and stars Harrison Ford as Linus Larrabee, Julia Ormond as Sabrina and Greg Kinnear (in his first starring film role) as David Larrabee. It also features Angie Dickinson, Richard Crenna, Nancy Marchand, Lauren Holly, John Wood, Dana Ivey, and French actress Fanny Ardant. Sabrina was released on December 15, 1995, by Paramount Pictures. The film was a box office disappointment, but earned mostly positive reviews from critics. The Saturn Award for Best Actor is an award presented annually by the Academy of Science Fiction, Fantasy & Horror Films to honor the top works in science fiction, fantasy, and horror in film, television, and home video. The Saturn Awards were devised by Dr. Donald A. Reed, who felt that films within those genres were never given the appreciation they deserved. The physical award is a representation of the planet Saturn, surrounded with a ring of film. The award was initially and is still sometimes loosely referred to as a Golden Scroll. The award for Best Actor was first introduced in 1976 for the 1974 and 1975 years, to reward a lead performance by a male actor in film. The record for most awards is held by Robert Downey, Jr. and Mark Hamill with three wins, with Jeff Bridges and Harrison Ford as the only others to have won more than once, each winning twice. Tom Cruise is the most nominated actor in the category with ten nominations, with Arnold Schwarzenegger being second with seven (two of which for playing The Terminator) and Harrison Ford (all of them for playing either Han Solo or Indiana Jones) and Robert Downey, Jr. (three of which for playing Iron Man) being tied for third with six nominations. Arnold Schwarzenegger also holds the record for most nominations without a victory. Anthony Hopkins and Martin Landau are the only actors to have won the Saturn Award for Best Actor and an Academy Award for the same role; however, Landau won the Academy Award for Best Supporting Actor and not Best Actor. Hamill is the only actor to have won the award several times for the same role, doing so three times out of four nominations. That Royle Girl is a 1925 American silent comedy film directed by D. W. Griffith and released by Paramount Pictures. The film was based on the novel of the same name by Edwin Balmer, and starred Carol Dempster, W. C. Fields and Harrison Ford. It is now considered lost. The Fugitive is a 1993 American action thriller film based on the 1960s television series of the same name created by Roy Huggins. It was directed by Andrew Davis and stars Harrison Ford and Tommy Lee Jones. After being wrongfully convicted for the murder of his wife and unjustly sentenced to death, Dr. Richard Kimble (Ford) escapes from custody (after a bus-train wreck) and sets out to find his wife’s killer, catch him, and prove his innocence, while being pursued by a team of U.S. Marshals led by Deputy Samuel Gerard (Jones). The Fugitive premiered in the United States on August 6, 1993, and was a major critical and commercial success. It was the third-highest-grossing film of 1993 domestically, with an estimated 44 million tickets sold in the US. It was nominated for seven Academy Awards including Best Picture; Jones won the Oscar for Best Supporting Actor. It was followed by a 1998 spin-off, U.S. Marshals, in which Jones reprised his role as Gerard. The Secret Life of Pets 2 is an upcoming American 3D computer animated comedy film produced by Illumination, directed by Chris Renaud and written by Brian Lynch. It is the sequel to The Secret Life of Pets (2016) and the second feature film in the franchise. The film features the voice talents of Eric Stonestreet, Kevin Hart, Jenny Slate, Ellie Kemper, Lake Bell, Dana Carvey, Hannibal Buress, Bobby Moynihan, and Renaud reprising their roles from the first film, whilst new cast members include Patton Oswalt (replacing Louis C.K. ), Tiffany Haddish, Nick Kroll and Harrison Ford (in his first animated film role). The film is scheduled to be theatrically released on June 7, 2019, by Universal Pictures. The film was nominated for eight Academy Awards and won two, for Best Original Screenplay and Best Film Editing. It was also nominated for seven BAFTA Awards, winning one for Maurice Jarre's score, and was also nominated for six Golden Globe Awards. William Kelley and Earl W. Wallace won the Writers Guild of America Award for Best Original Screenplay and the 1986 Edgar Award for Best Motion Picture Screenplay presented by the Mystery Writers of America. Harrison Ford was nominated for the Academy Award for Best Actor.